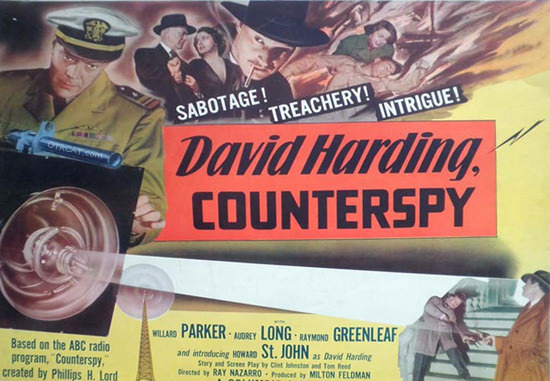 Washington calling David Harding, counterspy! 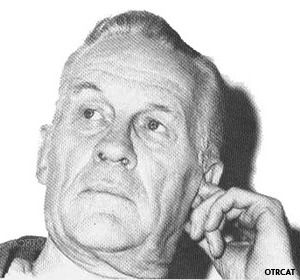 Phillips H. Lord (of Gangbusters fame) was a radio production legend. One of his first successes was the creation of "Seth Parker", a composite of the Down East New England preachers Lord knew growing up. NBC picked up the character and ran "Sunday Evening at Seth Parker's" six days a week from 1929-39. 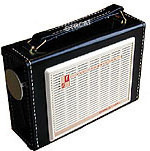 In 1933 Lord's came up with the idea of buying a sailing ship, then broadcasting his adventures via short wave to the network. A team of celebrities and scientists were to accompany Lord to exotic locations around the world, but the highly promoted project fell apart when Lord's ship, the Seth Parker, became unseaworthy in a storm off the coast of American Samoa. The popular program Gang Busters was another creation of Lord's, running from 1935-57. Gang Busters was billed as "the Crime Fighters of American Broadcasting." Authentic case histories were used for script material, and opened with machine-gun fire and screeching tires. A feature of the show was up to the minute reports on the FBI's Most Wanted criminals. The Counter Spies were a fictional unit of the Federal Government. Lead by Chief Counter Spy David Harding, the unit was tasked with investigating all reports of suspicious espionage activities funneled to them. Initially the program combined the crime drama thrills of Lord's Gang Busters with the nation's growing patriotism and security awareness in the aftermath of Pearl Harbor. Promotional teasers for the show intimated that Lord had served in official but very confidential intelligence work for the government in the late 30s. His popularity with law enforcement resulting from Gang Busters allowed him access to files of police departments and the FBI, which became rich sources of plot material for Counter-Spy. Lord held back as little in pursuing production quality. Two sound effects men were reported to spend 10 hours in rehearsal to get the atmosphere just right. Sound was more than background, the effects were vital to presenting the plot of each episode. As WWII came to a close, and with it concerns about Gestapo and Japanese Black Dragon spies, the Counter-Spy unit still found much to do by foiling the activities of Cold War enemies as well as Narcotics thugs. The early plots on Counterspy were counter espionage against Germany's Gestapo and Japan's Black Dragon while WWII plots focused on more generic counter-espionage plots like those of I was a Communist for the FBI, This is Your FBI, Intrigue, and FBI in Peace and War. For more espionage and adventure see: The Silent Men, Spy Catcher, Cloak and Dagger, Counterspy - David Harding!, Dangerous Assignment, The Adventures of Frank Race, Harry Lime (The Third Man), Secret Agent K7 Returns, Top Secret, and The Man Called X. 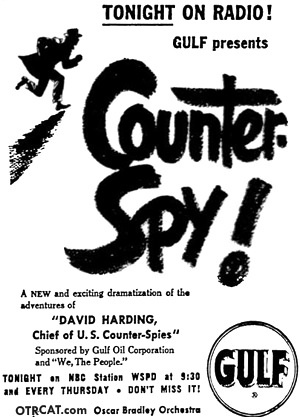 Be the first to comment on "Counterspy (David Harding, Counterspy!)"